If you are a faithful member of the Twitter family (a dysfunctional union, at best) and you follow most of our indigenous twitter bigwigs, you must have been privy to what this article is all about. Unlike some of our writers, and of course, pastors, I will go straight to the point without boring you with endless semantics. This morning, one of our highly placed Nigerians, Mr. Dele Momodu (@DeleMomodu), in what seemed to be politician’s spiel, drummed up support (or possibly public sympathy) for our one and only Mrs. Okonjwo Iweala (@NOIweala). This he did, or at least tried to do, through his timeline on twitter. The question of whether or not he succeeded shall be best answered by the disposition of most tweeps. As expected, this act was greeted with different reactions; some in support while others vehemently opposed. Amongst other commentators, three persons stood out – Ayobami Oyawolo (@ayourb), (@payme_my2cents) and J. Japheth-Omojuwa (@omojuwa). Save for Omojuwa, Mr Momodu’s tweets didn’t go down well with the others. Ayobami, like an angered prosecutor, questioned the rationale behind Mr Momodu’s position. He demanded to know Mrs. Iweala’s achievements especially in relation to helping the poor. My friend, @payme_my2cents also opposed his (Mr Momodu) views. According to her, Mr Momodu is more of a respected business man than a sincere advocate for change (I share these views). In a few lines, I would quickly react to this line of argument. Firstly, I must submit that Mr Momodu is a successful business man. However, asserting that he’s a sincere patriot advocating for (positive) change amounts to standing truth on its head! For starters, one cannot prepare for war and peace at the same time. In Mr Momodu’s defence, he argued that journalism tenets demand that all topics are treated objectively and all human beings good or bad are given a voice like in law but my question is “Do the poor get represented? Are there any chances for them? How often do the oppressed get represented or featured? Didn’t the same tenets make provisions for the poor?Nobody should tell the man how to run his business or who to feature but if he intends to rely on the tenets of journalism, then he should do it stritu sensu. TL;DR*? I would say Mr Momodu is a business man and should be treated as such! 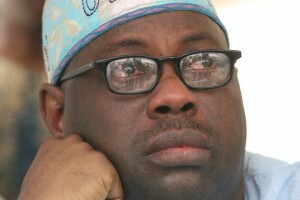 I think Dele Momodu is a businessman and an advocate for change. You can prepare for peace by getting yourself ready for war.